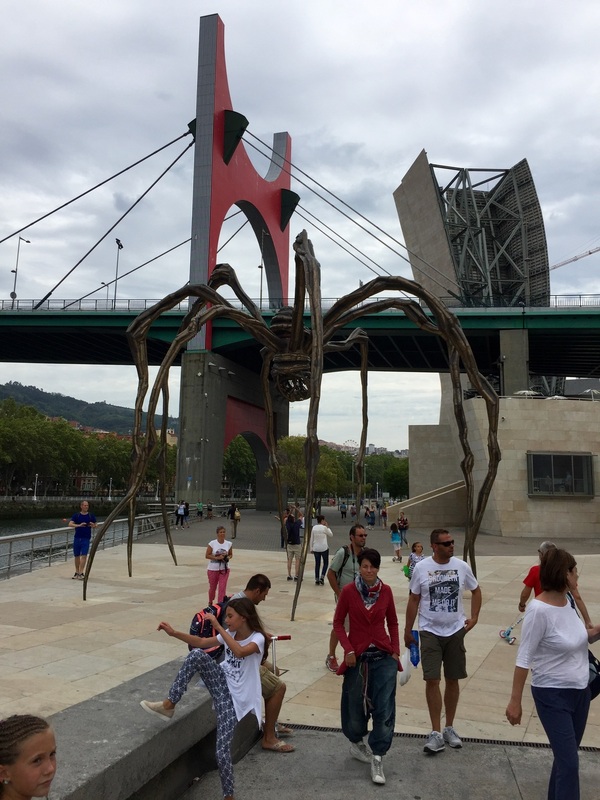 Louise Bourgeois' spider sculpture Maman creeps around the riverside entrance to the Bilbao Guggenheim contemporary art museum. I suspect the name Maman is a play on Mammon - the God or demon of greed. I also suspect that the placement of Maman outside the entrance to the Guggenheim Bilbao is deliberate and correlates with the motto of the San Francisco, California based Bohemian Club which reads "Weaving Spiders Come Not Here". Louise Bourgeois died in May, 2010, and was canonized posthumously by the art establishment. I believe the two primary reasons for this canonization were 1) that she could be conveniently labelled a feminist, even though she herself stated that she had been made into a feminist icon by other people, and preferred the company of men, and 2) her giant spider served a purpose: the art propaganda cabal could employ it towards a kabbalistic gender balance at the Guggenheim Bilbao and potentially elsewhere. Although this may seem a stretch, take a look at the following images of the Bilbao Guggenheim as seen from the Nervion River - I believe that the Frank Gehry-designed building may actually be a giant owl unfolding its wings. 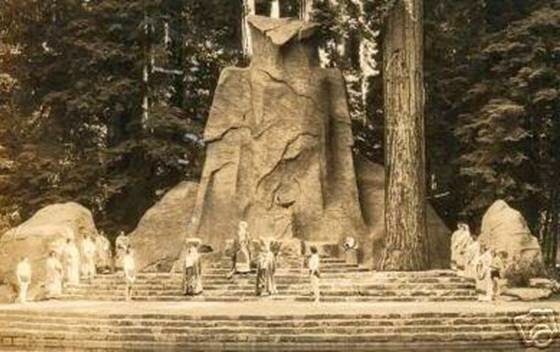 Compare it to the subsequent image of the Moloch owl which is at the Bohemian Club's camp Bohemian Grove in Northern California. Do you see any similarity? What would be the point of such architectural iconography? Well, my dear muggle, you are surrounded by such - but are part of the profane if you refuse to see it. The primary purpose of sacrifice to Moloch - as far as I'm aware - is Cremation of Care. Also check out the placement of the lakes in front of the platforms of both the Guggenheim Bilbao and Bohemian Grove. Guggenheim Bilbao = Moloch Owl?